Well, it was kind of nice to get some much needed rain. The ocean was churned up, and the winds were around 25 mph, and it rained for a day and half. Not too much happened. The seas are calming down right now and the port is open. 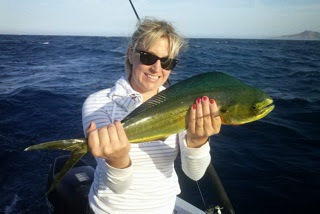 The dorado always go nuts after a storm, so its time to go fishing. 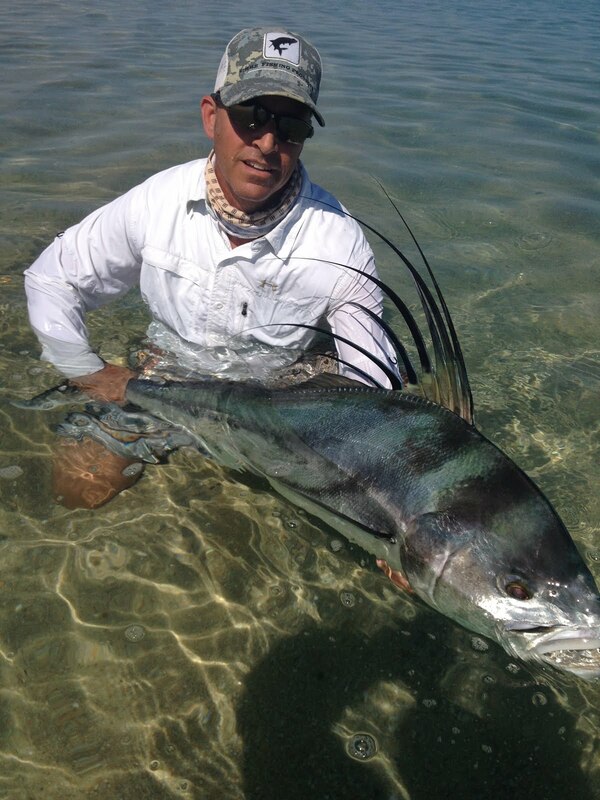 A few shots of a 20# plus roosterfish off the beach, note the fly in his mouth..
We had a great time and the Baho Anglers shirt fit perfect. 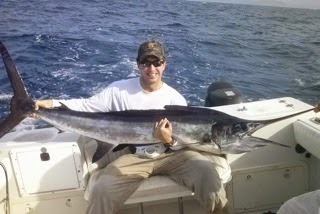 We are seasoned off shore fishermen and have never had a 60 fish day on any prior ocean fishing trips. 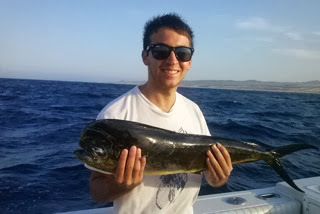 All our fish last Friday were caught in the first 3 hours of fishing. 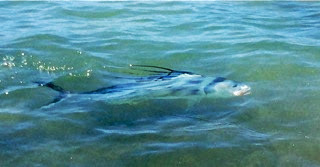 We could have easily caught 100 fish if we hadn't decided to try to get a rooster fish for the last hour of the trip. We will save that event for a future trip. Your captain and mate were top shelf and worked hard to keep us on fish and avoid line tangles. We had double and triple on lines for much of the morning. You will see us again. 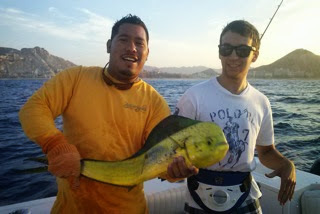 The offshore fishing for marlin and dorado is still very good.. 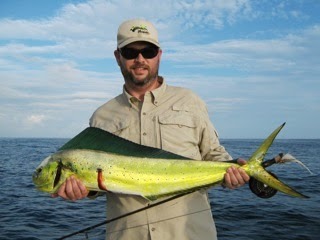 The dorado are mostly on the small side, and are great fun for the family. Some bigger Do-Dos up to 30# are also being caught. 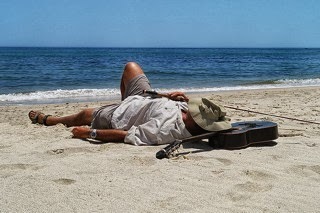 August and September is traditionally the slow tourist time in Cabo, but the fishing is usually very good... We have flat seas, and calm winds.. Daytime highs around 95 and night times in the 70s. 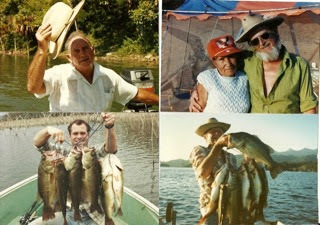 Every once in a while I thought I would share some memories from my fishing in Mexico over the last 32 years.. 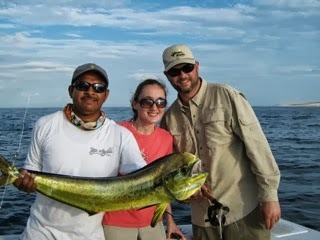 This is Jeremy's first marlin ( on a spinning rod-stand up) and Jessica's first dorado. They has shots at big roosters, but couldnt keep them on. All this on a half days outing.